In 1949 an English man moved his family from abroad to New Jersey to open a confection business. Equipped with a tablet presser and wrapping machine, Edward Dee founded Ce De Candy, Inc. and began production of Smarties candy rolls. The candies weren’t exactly a unique idea. Edward’s brother, David Dee, had specialised in fizzy compressed tablet candies in the early ’30s. The name wasn’t unique, either. Nestle’s Smarties Chocolate Beans used the name beginning in 1937. Nonetheless, Smarties became a popular treat and within ten years the company had moved from a small, rented facility in Bloomfield, NJ to a larger facility in Elizabeth, NJ. In 1967 Union, NJ became it’s final home. A Canadian factory was opened in 1963. Ever since, Smarties (or, Rockets, as they’re called in Canada in order to avoid confusion with the Nestle Smarties) are produced around the clock, and the company ships billions of rolls each year. In 2011 the company’s name was changed to Smarties Candy Company, and Edward still shows up for work regularly. Smarties are made from dextrose, citric acid, calcium stearate, colors and both natural and artificial flavors. A standard roll has just 25 calories and 6 grams of carbs. Classic Smarties come in six flavors: orange cream (white), pineapple (yellow), cherry (pink), strawberry (green), grape (purple) and orange (orange). Smarties are gluten-free. For more than 60 years Smarties have been a top pick for those with a serious sweet tooth. They’re inexpensive, easy to eat, and are lightweight. It is reported that Smarties is the most handed-out candy on Halloween in the US. 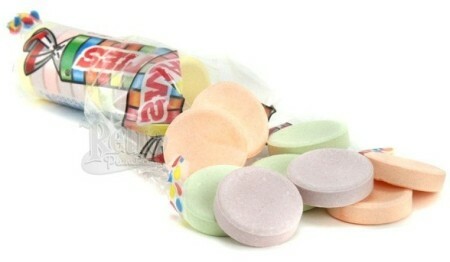 Do you remember the first time you tried Smarties?